On 13 December 2018, the summit of the European Council will be held, during which the issue of the continuation of sectoral sanctions against Russia will be discussed. Some EU member states, such as Italy, have already indicated that prolongation of sanctions should not be automatic. Representatives of different member states have repeatedly complained that sanctions harm their economies. For example, Italian Vice Premier Minister Matteo Salvini is known for his sharp statements about sanctions: in particular, he calls them “social, cultural, and economic madness,” while Italian agricultural associations declare losses of three billion euros per year. In early 2018, minister-presidents of the five German federal states demanded that the federal government of Germany weaken sanctions against Russia. 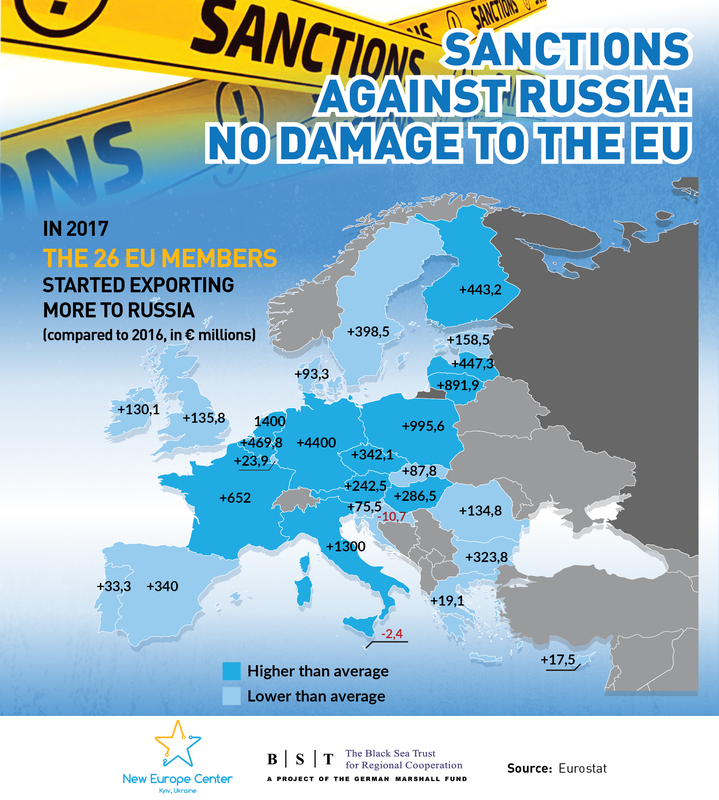 In France, Greece, Austria, Hungary, and a number of other countries, statements regarding billions of losses from sanctions against Russia (or the countermeasures imposed by Russia against the European Union), as well as the need to reduce sanctions or lift them completely have been heard repeatedly. 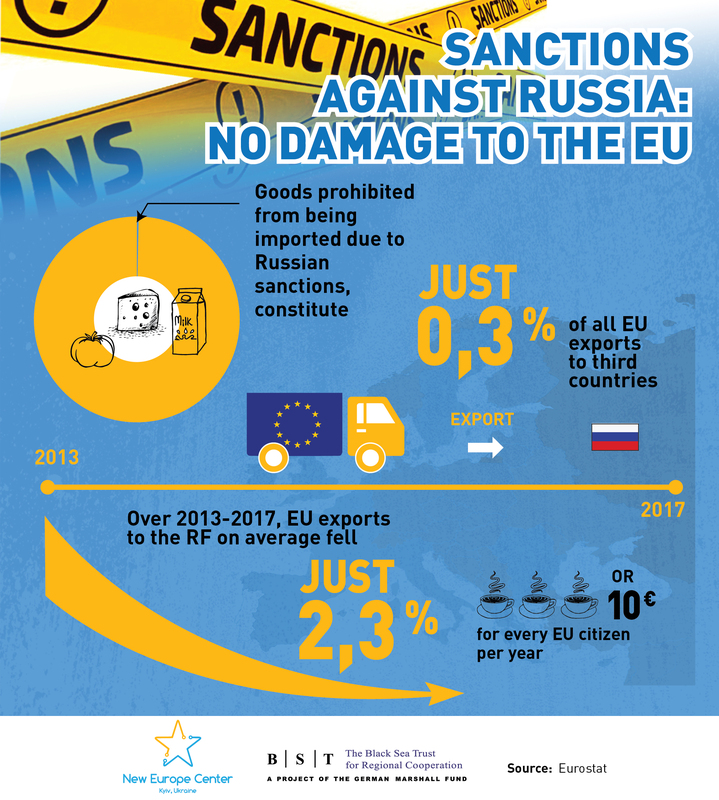 The share of goods banned from export to the Russian Federation in 2014 is very small and amounts to only 0.3% of the EU-28 exports to third countries. EUR 18 bn versus 5.4 bn. 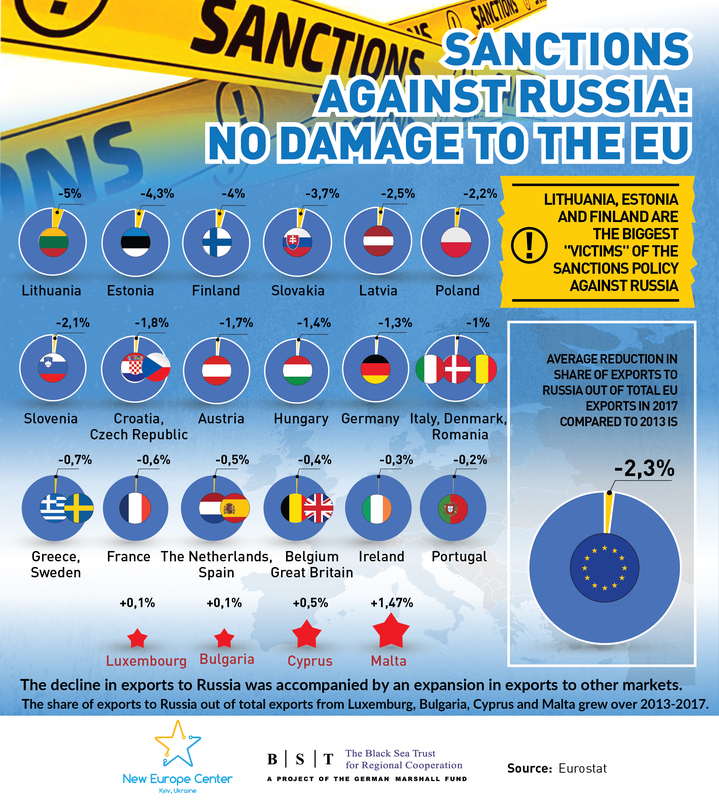 The top 5 countries most affected by the decrease in exports to the Russian Federation in 2014-2017 are Lithuania (5% drop), Estonia (4.3%), Finland (4%), Slovakia (3.7 %) and Latvia (2.5%), e. the countries that do not voice opposition to the sanctions. Instead, countries where politicians occasionally make statements about lifting the sanctions, have been affected much less: e.g., Germany by 1.3%, Italy by 1%, France by 0.6%, and Greece by 0.7%. In 2017 (compared to 2016), 26 countries of the European Union (with the exception of Malta and Croatia) showed an increase in exports to the Russian Federation. Exports from France increased by 12%, from Italy by 16%, and from Germany by 17%. The average growth for the EU-28 is 12%. In 2018 the tendency for growth in turnover with Russia continued for the majority of the EU member states. The New Europe Center also analyzed the positions of those countries that stirred major reservations about the probable revision of the sanctions policy against Russia recently: Italy, Hungary, and Austria. The cautious forecast is that in December 2018, sanctions against the Russian Federation are likely to be renewed again for six months. 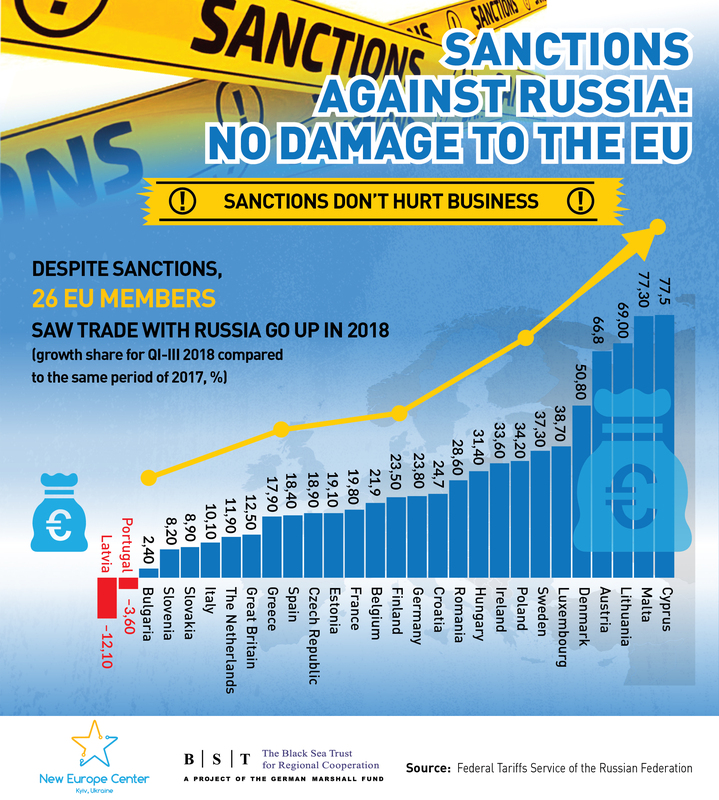 Italy has been the most outspoken opponent of sanctions policy among all the EU Member States and some Ukrainian officials consider it to be the most problematic country for the EU unity. In the first place, it has become the first EU Member State which made lifting of sanctions against Russia part of its coalition agreement. Its Vice Prime Minister and “Lega’s” chief Matteo Salvini hasn’t missed an opportunity to underline the uselessness and damage of sanctions as well as the necessity to lift them, having paid two visits to Moscow since taking the Vice Prime Minister’s seat in end May 2018. However, Salvini keeps silent on the fact that the share of the products banned by Russia only amounted to up to 1% of total Italian agrifood export as compared to 2013 figures. Moreover, Italian agrifood exports worldwide have been on a steady rise since 2013 and in 2017 hit a new record on EUR 41 bn. Russia’s share in it made just 2% in 2013, while the share of banned foods in the Italian total exports to Russia make only 1.7%! This means that even if Russia lifts its food embargo, this would hardly lead to significant improvement in the Italian economy, especially taking into account that Italy is the second industrial power in the EU. Even if Russia lifts its food embargo, this would hardly lead to significant improvement in the Italian economy, especially taking into account that Italy is the second industrial power in the EU. What is more, with the growth since 2016 of global oil prices the economic situation in Russia has stabilized with immediate impact on Russian import, including from Italy. Thus, in 2017 the growth of total Italian export to Russia amounted to 18.9%, while the agrifood export increased 25.2% against 2016 despite ongoing Russian food embargo. The cooperation between Italy and Russia also runs actively in other spheres too: in 2018 during Italy’s Prime Minister Giuseppe Conte to Moscow 13 bilateral contracts, including with the sanctioned “Rosneft” company, were signed with an estimated value of 1.5 bn euro. Salvini must know it well – that is why lifting sanctions on Russia has never been a negotiation point in Italy’s standoff with the EU over its budget. Rather the opposite: fighting for budgetary concessions, Italy used to drop the sanctions card “in exchange,” as it already happened during the sanctions revision at the EU summit in December 2015. Chances are that in December 2018 this will be repeated, however, vocal declarations of how much the Italian economy suffers from the sanctions allow Italy to raise the bargaining stakes. It looks like Italy will continue its doppio binario policy of loud flirtations with Russia and tacit keeping up with the EU unity, adopting a policy which will block the strengthening of sanctions (like it was with the EU initiative of imposing sanctions against states which conduct cyber attacks, when Italy was the only country which opposed the initiative) but upholding the existing ones. As a Vice Prime Minister and Minister of Interior, Salvini can afford scandalous statements for reputation purposes, while the officials who are directly responsible for the foreign policy so far have been unambiguous about Italy’s continued support for the sanctions regime until the full implementation of the Minsk agreements. Italian experts emphasize that Italy would not try and sabotage sanctions on its own – it is only possible if other countries rally behind, among which Hungary and Austria, inter alia, are named. Meanwhile, Italy is trying to push through a proposal to support small enterprises in Russia as a way to sweeten the pill and demonstrate its loyalty to the Kremlin. The rhetoric of the Italian decision-makers contains meaningful nuances: they rather mention talking about lifting sanctions than about actually lifting them. The rhetoric of the Italian decision-makers contains meaningful nuances: they rather mention talking about lifting sanctions than about actually lifting them. It is also worth mentioning that the lavish anti-sanction commentaries of the Italian Vice Prime Minister even stirred tensions between Rome and Washington, up to the point when, as the Italian media report, Salvini’s upcoming visit to the US could be called into question. It was for this reason that Salvini met the US Ambassador to Italy Lewis Eisenberg soon after the former returned from Moscow. All things considered, it looks like the Italian government will not “play a veto card” until the elections to the European Parliament, due in May 2019, which will demonstrate whether populists or democrats will tip the scale in the power balance in the EU. Hungary: who will take the first step? The Hungarian government widely exploited the thesis of significant losses of the country’s economy from the sanctions. Currently, Budapest and Moscow state a dramatic increase in trade turnover: over the nine months of 2018, Hungary’s trade with Russia has increased by over 30% to $5.1 bn. Sometimes Hungarian officials explain the cooperation with Russia by the fact that Western Europe has signed enormous contracts with Moscow long ago, and therefore, why Hungarian businesses should be the only ones to suffer? After Russia’s aggression against Ukraine and the imposition of sanctions, different figures for losses have been heard in Hungary (about EUR 6-7 bn). However, government officials have not yet explained the source of such a high figure, as the decrease in trade turnover was also caused by the decrease in Russia’s purchasing power and energy prices drops. 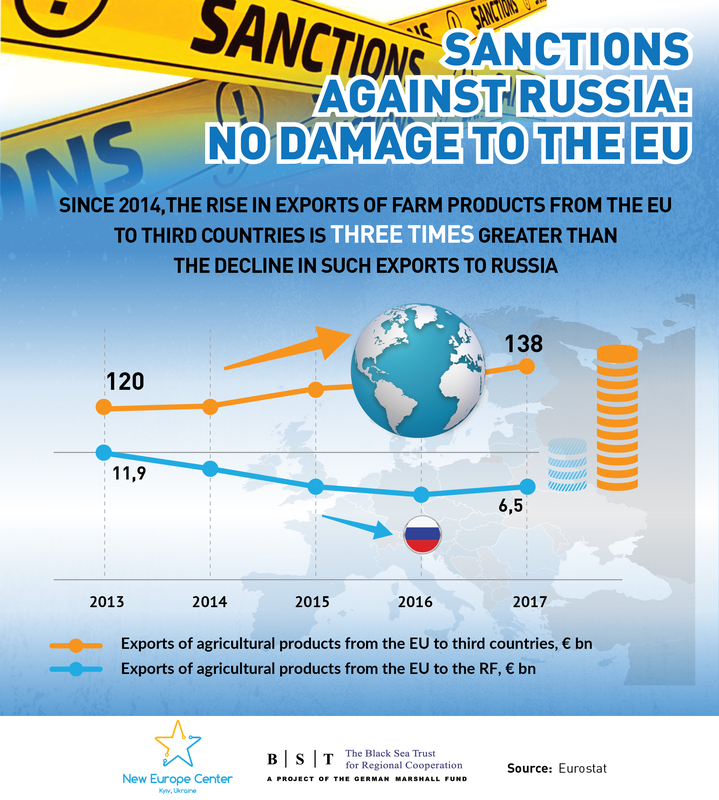 It should be noted that the counter-sanctions imposed by Russia on agricultural products from the EU countries affected a rather limited group of Hungarian products. In the pre-sanction year of 2013, Hungary exported EUR 78.1 mn worth of such goods to Russia. This figure is extremely low considering its share in the total exports of goods (only 0.4%). And it does not take into account the export of Hungarian goods to other EU countries, otherwise, the figure would be even closer to 0. However, we should take into account the fact that it is quite risky to be considered a pro-Russian politician in Hungary. Viktor Orban, who launched the “Eastern Opening” policy in 2009, constantly emphasizes that his policy is primarily in line with the interests of Hungary. Hungarian society is quite critical towards Vladimir Putin’s policy: half of the Hungarians (48%) disagree with it, while only one third (33%) agrees with his approach. It is quite risky to be considered a pro-Russian politician in Hungary. Representatives of the Hungarian authorities have long been talking about the need to revise the sanction policy. However, so far, Budapest has been refraining from vetoing any EU restrictive measures. The Hungarian authorities are unlikely to initiate a review of sanctions policy; however, they might as well join the camp of the “sanction killers.” The main question is who will take the first step. Viktor Orban may criticize the sanctions, but he is unlikely to go against the entire European Union on this issue. Moreover, the Hungarian authorities are now not in the best condition to impose terms on the other EU states due to their severe criticism caused by the issues with the fundamental values of the EU. It is also about the frustration of the colleagues within the European People’s Party, where a substantial number of politicians are critical towards the Fidesz party. The question of the membership of this party in the EPP is sharply debated before the elections to the European Parliament, which will take place in May 2019. The American factor is also worth noting, as the Hungarian Prime Minister is trying to reestablish relations with the US that had imposed a strict sanction regime on Russia. Any attempts by Budapest to veto European sanctions may raise questions in Washington. The impact of anti-Russian sanctions on the EU and Russia’s counter-sanctions on the Austrian economy has become the subject of heated debate as soon as they were imposed. However, in terms of decrease in Austrian exports to Russia, in pre-sanction 2013, it amounted to 3.2% of the total exports of Austria, and to 1.5%. in 2017. Accordingly, Russia was not even in the top ten trading partners of Austria. When oil prices increased in 2017, Austria’s exports, like most other EU countries, to Russia in 2016-2017 grew by 242.5 mn, i.e. by 11%. Moreover, exports from Austria to Russia are dominated by machinery and equipment, chemical products, and processed goods. Therefore, the Russian embargo on the import of a range of agricultural products did not hurt the Austrian economy. In 2013, the share of goods affected by the counter-sanction regime constituted only 0.3% of Austria’s total agricultural exports to third countries. The results of the diversification of trade partners in 2013-2017 should be also noted: an increase in exports to the PRC by EUR 1.2 bn, to the US by $2.7 bn and others, which completely covered the reduction of exports to Russia. The high level of Austria’s energy dependence against the total imports of Austria in 2014 (65.8%) is a significant aspect. In this context, the EU’s anti-Russian sanctions are not critical, given the example of the extension of a contract for the supply of Russian natural gas by 2040 by the Austrian oil and gas concern OMV, a participant in the North Stream 2 project. The potential US sanctions against Russia, associated with this project, cause more worries. Overall, the “business as usual” principle does not lose its weight. Among vivid examples are the activities of Raiffeisen Bank, Doppelmayr or Strabag (one of the largest construction companies in Europe) that continue their fruitful cooperation with Russian partners. Thus, anti-Russian sanctions imposed by the EU do not cause significant losses to the economy of Austria. Despite the statements of certain Austrian politicians, mainly representatives of the Liberty Party, economic experts, and businessmen, Austria is in solidarity with European partners in extending the sanctions against Russia. This consistent position is conditioned by the following factors. Since the formation of the Austrian coalition government, led by Sebastian Kurz, a consistent line of sanction behavior has been chosen, i.e. the full support of European policies, until the Minsk Accords are successfully implemented. The support of sanctions by the official Vienna continues despite the close relationship between the leadership of Austria and its Russian counterparts (up to the visit by the Russian president to the wedding of the head of the Austrian Foreign Ministry), as well as a powerful corporate lobby for the lifting of sanctions. The Austrian Chancellor has managed to negotiate with the coalition partners, the eurosceptic Freedom Party, which, by the way, has an agreement with the “United Russia,” and to maintain the predictable political course of the country. Therefore, the statement by the leader of the Freedom Party and Vice Chancellor Hans-Christian Strache about the abolition of sanctions (he even supported the annexation of Crimea by Russia in his election speeches, describing this act as irreversible) is not an illustration of the official position of Austria, as the Chancellor or the President of Austria have never voiced such a position. The Austrian Chancellor has managed to negotiate with the coalition partners, the eurosceptic Freedom Party, to maintain the predictable political course of the country. No less important is the Austrian presidency in the EU, during which the government is not going to undermine its credibility with anti-European actions. The results of the presidency should be a personal success of Sebastian Kurz and raise his rating, thus logically summing up the first year of his activities. Austria also supported the imposition of sanctions against Italy, if it does not change the budget for 2019; this step, accordingly, reduces the chances for a partnership between the two countries to lift the restrictive measures against Russia. A recent spy scandal story will not inspire the ruling circles of Austria for any steps toward Russia. A recent spy scandal story will not inspire the ruling circles of Austria for any steps toward Russia. However, it is too early to talk about any significant change in the attitude of the Austrians toward Russia, as the government’s response to the scandal was rather restrained. In one of the recent statements, Sebastian Kurz noted that Austria will continue the dialogue with Moscow. The official visit of the head of the Ministry of Foreign Affairs Karen Kneissl to Russia on December 2-3 was canceled; however, no Russian diplomat has been expulsed. Importantly, the accused army colonel wasn’t taken into custody during the trial. In other words, the situation in Austria is currently unfavorable for opposing the continuation of sanctions. The situation with the Russian attack on the Ukrainian ships in the Azov sea made the situation even graver: Austrian foreign minister Karin Kneissl already said that more sanctions towards Russia cannot be excluded in the aftermath of the attack. Not all types of agrifood products fall under Russian embargo. The New Europe Center states its mission as developing analytical research and conducting project activities in order to promote European standards and practices in Ukraine, as well as increasing support of Ukraine’s European and Euro-Atlantic prospects among opinion leaders and EU and NATO officials. It is located in Kyiv.